What is the relationship between aging populations and cities? How can we advance more innovative, age-inclusive cities? This is the first installment of our research journey into this topic. We invite you to join us in our discoveries. Rapid demographic transformations across the globe make one of the most burning questions of our time evermore relevant: how do we deal with population aging? CITIES Foundation approached this question as the base of a new area of research exploring the relationship between aging populations and cities. In time, this global research is intended to fuel local project development and implementation. Now at the beginning of our journey, I am leading the research and will report findings in a series of Featured Articles. What follows is the first installment of this journey. Japan repeatedly tops the lists in population aging statistics, reporting the highest percentage of elderly. In 1990, roughly 10 people between the ages of 15-64 supported every two elderly in Japan. It is estimated that in 2040 that same number of people will need to support almost seven elderly. Japan is closely monitored by other nations coping with rapidly aging populations, such as the United States, Germany and the Netherlands. More and more, population aging is becoming a problem in developing nations, too, as they are aging at a much faster rate than the developed countries. As population aging increases, we see a new sociodemographic group emerging: the Young-Olds. Architect Deane Simpson, following social historian Peter Laslett and gerontolist Bernice Neugarten, explains in his book ‘Young-Old: Urban Utopias of an Aging Society’ that we have moved from a three-phase life course to a four-phase life course. One’s life course used to be characterized by phases of childhood, adulthood and old age. Since the 1950s, we are shifting towards a life course in which the last phase – old age – is split into a Young-Old age (Neugarten) or Third Age (Laslett) and an Old-Old age. This shift has been made possible due to various political, economic and cultural developments, such as the institutionalization of retirement, as well as healthcare improvements. The Young-Olds can be described as a group of healthy, active and independent retirees largely free of responsibilities. Over the next few years, this sociodemographic group is expected to grow extremely fast. 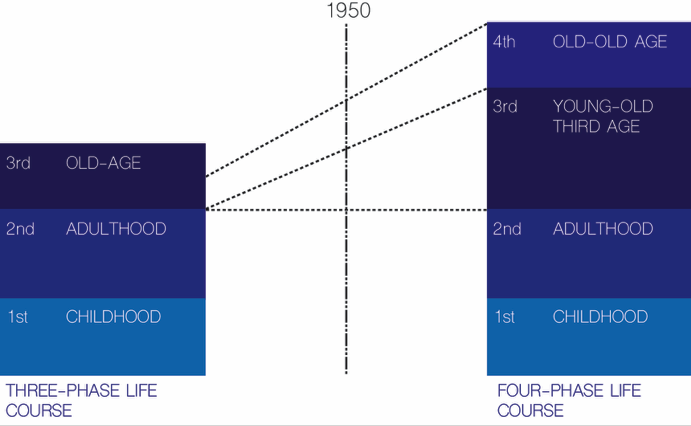 From a three-phase to a four-phase life course (Source: After Deane Simpson, Young-Old: Urban Utopias of an Aging Society, 2015; Peter Laslett, A Fresh Map of Life, 1989; Bernice Neugarten, Age Groups in American Society, 1974). In his book, Simpson tries to answer whether this group of Young-Olds has urban correlates. There seems to be a discussion between, on the one hand, a body of people who hold that we should integrate the elderly into urban areas of mixed ages, and on the other hand, a group of people who argue that it is okay or even socially and economically beneficial to segregate the elderly. The widely consulted World Health Organization’s ‘Global Age-Friendly Cities’ guide is confidently in favor of the former. Divided over eight domains of urban life – from outdoor spaces and buildings to social inclusion – it prescribes numerous features of age-friendly cities, including age-friendly pavements and intergenerational interaction. Simpson, however, focuses on the latter argument and looks at various age-segregated communities across the world, such as The Villages in Florida, USA, Spain’s Costa del Sol and Huis ten Bosch in Japan. As noted, in a series of blog-style articles (this being the first), I will update you on our exploration of Simpson’s Young-Old urban utopias, as well as a number of related researches in the field of aging studies. Koko is about to graduate from the research master Urban Studies at the University of Amsterdam. Throughout his studies he has tried to combine planning and urban theory with urban design. Drawing inspiration from urban explorations across the world and being fascinated by everyday urban life, Koko encourages participatory and collaborative planning processes. At CITIES Foundation he now researches the relationship between aging populations and cities. IS THE SADDLE A GRAVE? An article on our cultural obsession with the automobile with inspiration. 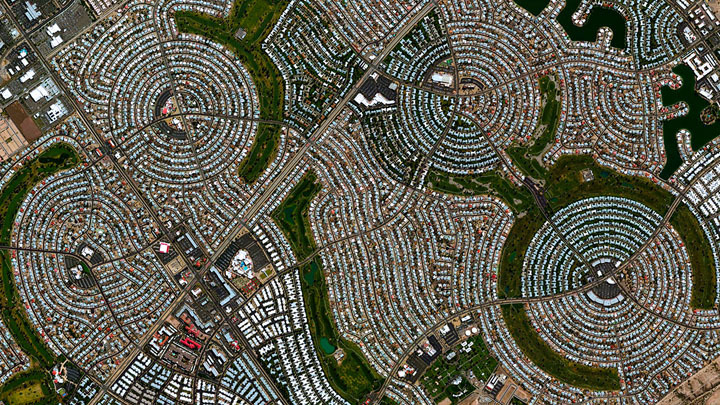 Building our cities around this inefficient and deadly machine. In their book ‘Sustainism is the new modernism’ Michiel Schwarz and Joost Elffers link many different developments together in a manifesto for Sustainism. The Tosti Factory aims to create awareness about what we eat and where it comes from. From February onwards you can go and see what precedes your tosti on your plate! An investigation into the diverse history and practice of architecture in Brazil, from Brutalism to socially progressive, locally influenced practices.